Classic Film & TV Cafe." The highlight of last July's Western Film Fair was--for me--the opportunity to spend 45 minutes sitting next to actress Piper Laurie. While she signed photos for charity, she graciously and thoughtfully answered all my questions about her 64 years in show business. It's an impressive career that netted her Oscar nominations for The Hustler, Carrie, and Children of a Lesser God. Café: When you first started in movies, you signed a seven-year contract with Universal, which you later described as a "prison that shielded...creativity." If you could go back, knowing what you know now, would you sign it again? Piper Laurie: No, I wouldn't. But, you know, I learned something from all my mistakes and it has made me who I am. That's part of life. I got to work more than most of the contract players. If I had been a different sort of person that could really speak up and fight for myself, I might have gotten--might have gotten--better parts. I doubt it, because they just didn't have those kinds of scripts. Café: Early in your career, you were paired multiple times with Rock Hudson and Tony Curtis. What were they like on and off the screen? PL: Well, Tony and I were good friends early on before we were put under contract. I met him when I was about 15. He came to my acting class and joined it. He flirted with me and we had some movie dates. He was a lot of fun. I liked him and he liked me. And then something very weird happened after I was signed at his studio. There seemed to be something going on, even though we were put together in lots of movies. It was never quite the same comfortable camaraderie that we had originally. Rock Hudson, on the other hand, was just a delight. Just a big laugh for a big eater. He was always broke, so he'd come to my mother's kitchen and get fed. He was a lovely man and I think he became a really accomplished actor. He got by early on, but I think he became very good later on in light comedy. Piper Laurie and Rock Hudson. Café: There's a great photo in your book of the two of you at a costume ball. PL: We were at some charity benefit. I went as the Greek goddess Circe and carried a live baby pig with me. 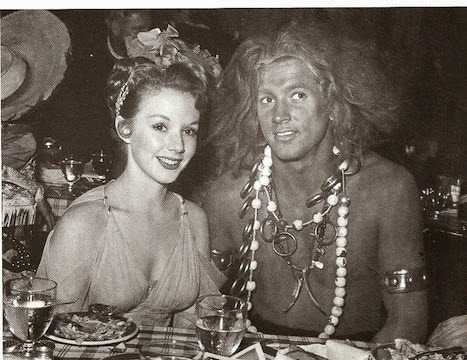 Rock Hudson was my date and he was dressed as one of my conquerors in dark make-up. He did look bizarre. Café: You starred in several live TV dramas like the Playhouse 90 production of The Days of Wine and Roses with Cliff Robertson. How did live television compare to being on the stage? PL: It's similar, but live television is much more extreme. It's really walking on the high wire. I don't think people today understand that when you did the show, not only could you not do it again, but it was going out on the air at that moment to everyone in the country. And whatever mistakes you made, that was it. You would live with it for the rest of your career. It was really chancy. It was a daredevil act. I was terrified and forced myself to do it, because I thought I should and thought I could. And it was very rewarding. Piper and Paul Newman in The Hustler. Café: You wrote in your autobiography that you were "too close" to appreciate The Hustler after you made it, but realized years later that it was a great movie. Have you felt that way about any other of your movies? PL: Yes, I recently saw Tim that I made in Australia. Café: It's a very good film. PL: Well, I liked it, too. I saw it and I was better than I thought I was. I either think I'm worse or I'm better. I'm a little out of my mind when I actually finish a project and my perspective is just not accurate. Café: Both you and your co-star Mel Gibson give fine performances in Tim. Did you see his potential then as a big star and future director? Mel Gibson and Piper in Tim. PL: Absolutely. I knew he would be a big star. I begged him not to come to America. I knew that once the movie was seen that people would want him to come. I said please stay here for another year or two and continue to work in the theater, which he had been doing. And he didn't pay any attention to me (laughs). It took several years before Tim was released. In the meantime, he made the Mad Max movies and became a big star. As a result of that, Tim was finally released. It's still rarely seen. Café: In your autobiography, you credit Carrie with giving you a "third career." It's a compelling film that has aged wonderfully. How did you come to be cast in it? PL: I was living in the country in Woodstock, New York, and they had been looking for someone to play the mother. I hadn't worked in fifteen years in a movie and some people I knew mentioned my name to Brian De Palma. An old agent sent me the script. I read the script and I thought it was just not very good. My husband (film critic Joe Morgenstern) said that Brian De Palma has a comedic approach to what he does. I thought, oh, I misread the whole thing...it's satiric. It's going to be a comedy. On that basis, I took the train into New York City and met De Palma, whom I liked enormously. I guess he liked me. By the time I got back to Woodstock, I heard he wanted me to do the movie. Weeks later, when I went out to rehearse, I had comedic things I had worked out. During rehearsals, De Palma said: "Piper, if you do that, you're going to get a laugh." That really floored me. So, I changed my interpretation slightly. At any rate, that's how I got the part. Café: What led to your directing of the 2006 short film Property? Piper at the Western Film Fair in 2014. PL: I'd had a trauma in my life. I had been living in my home for many years in the Hollywood Hills. There was a freak accident when a city worker mowed down a fire hydrant up above my house in the hills. And all night long, the water gushed down the street and ran down into my backyard and undermined everything. The whole hill came crashing down on my house. I was in bed at the time. It was nine o'clock in the morning and I was watching Meet the Press. I felt something shoving at my back. I looked out the window and, in the corner of my eye, I saw something moving--it was the hill. The mud was at the window. So, I just moved as fast as I could and got out of the house and drove away. The city promised it would take complete responsibility. I stayed in an apartment for four years while they rebuilt everything. I had to put all the things I created in storage--all my films, my paintings, my sculptures...everything that I valued. So, I was living in this stark apartment and I just needed something. I started to fill my life again with whatever I could creatively. I realized I was in love with the short story "Property" by James Lasdun and I'd love to see it as a movie. So, I set out to make that happen. Café: You seem to be a harsh critic of your own performances. Which ones are you the most proud of? Piper in A Little Night Music. PL: I guess, after all these long years, The Hustler and Carrie. I liked what I did in Tim. I liked what I did in the Playhouse 90 live show The Days of Wine and Roses, which was rough and not as slick as the movie. My interpretation differed from Lee Remick's, who was lovely in the film version--but different. I like my stage work, though I've never had it recorded. I really enjoyed working on stage. I did The Glass Menagerie on Broadway with Maureen Stapleton; that felt like it was good work. I liked the one-person play I did about Zelda Fitzgerald on tour, which William Luce wrote. And I just recently did my first stage musical, A Little Night Music. I played Madame Armfeldt in a production in Santa Barbara that opened a brand new theater there. I had a wonderful time. I'm also proud of the singing and dancing--for me--in Ain't Misbehavin'. Café: Did your ex-husband, film critic Joe Morgenstern, ever review any of your movies? PL: During the major part of our marriage, I wasn't making movies. I was going to see a lot of them. The first time he decided he would review me was for The Grass Harp (1995). He stated in the review that he had been married to me once and may have been prejudiced. He was very kind to me and I think nice about the movie. Café: And lastly, you've starred with many of the finest actors of the last 60 years. Who were some of your favorites and why? PL: George C. Scott, Paul Newman, Gregory Peck, Jack Lemmon, and one of my idols, Claude Rains. Piper Laurie will appear at the Mid-Atlantic Nostalgia Convention in Hunt Valley, Maryland, September 18-20, 2014. The convention's screening schedule includes the aforementioned Playhouse 90 adaptation of The Days of Wine and Roses. 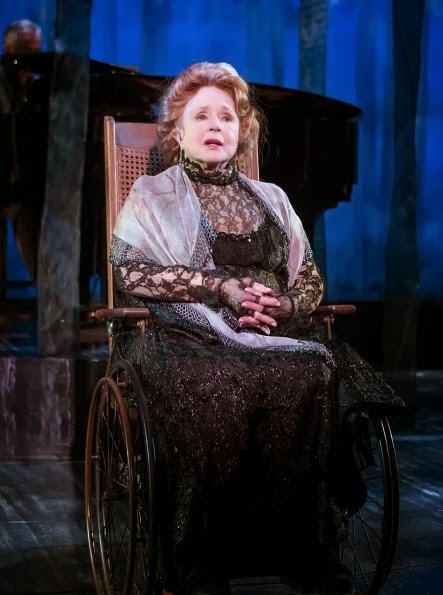 Great interview, I just love Piper Laurie, esp. in The Hustler and Twin Peaks, which I am currently rewatching. Thanks. How exciting!! Piper Laurie, rarely makes public appearances. She is still a beautiful woman. 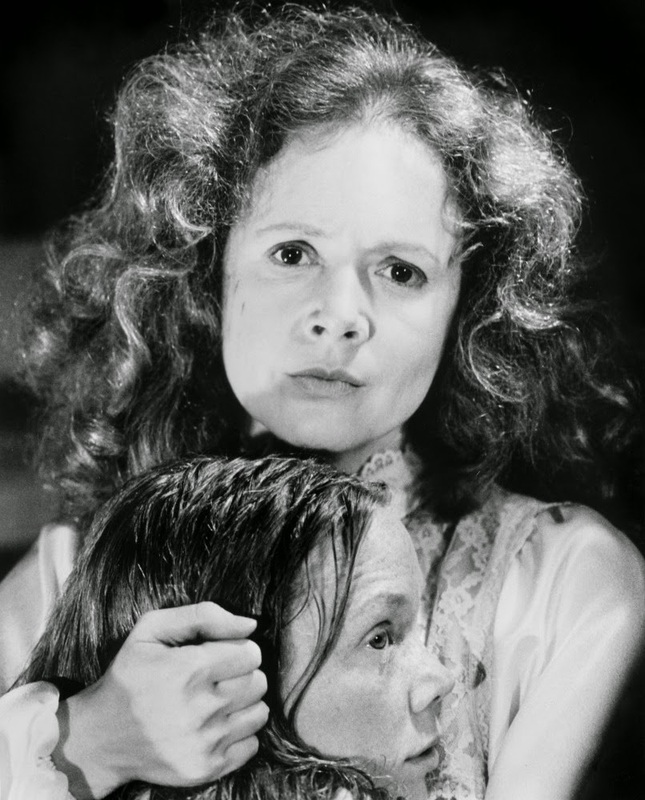 The Hustler, is my favorite Piper Laurie, performances. Thank you Rick, for sharing your wonderful experience with us. I love that cheesecake photograph. I've heard the "Carrie" story before, but it's still funny. Great stuff! Whenever I read about the early days of live TV dramas, I get goosebumps. So many things that could go wrong, so many people to witness it! : ) Piper's portrayal of Carrie's mom is one of the great supporting performances in all of horror film. What a fabulous interview and you did a great job with all the photos, Rick! I really like "Tim" and thought Piper was remarkable in "Twin Peaks". I enjoyed reading her gracious remarks about several co-stars. I cannot imagine how frightening it would be to hear the sounds and see the mud slide by from where you are sitting in your home. It was very kind of Miss Laurie to share her memories and experiences with everyone at the Cafe. Looking forward to meeting her at the Mid-Atlantic Nostalgia Convention in two weeks. I get to have dinner with her and have my photo taken. I'll post the photo on my Facebook account. The convention is a cool show to meet celebs! I am 71, a decade younger than Piper Laurie, but I had such a terrible crush on her in the late 50s that I remember her fondly still. Her performance (and her looks as a mature beauty, even as a virginal 'old maid') in TIM was a reaffirmation of the deep beauty that the lady brings to the screen.